On 11th October 2018, the Star Wars universe came to Daresbury Laboratory. Professor Carsten Welsch, Head of the Liverpool Accelerator Science group, gave a special staff seminar on the Physics of Star Wars. This followed on from a highly successful event he organised for Liverpool staff and students last year. The special event included hands-on demonstrations about superconducting magnets, droid races and computer games into the maximum acceleration that can be achieved using plasmas – asking questions about how fast we can accelerate macroscopic objects such as space ships with current technology. It also featured posters that linked the Star Wars universe to research currently being undertaken in his QUASAR Group. This led to many interesting discussions about the accelerator science R&D at CI. 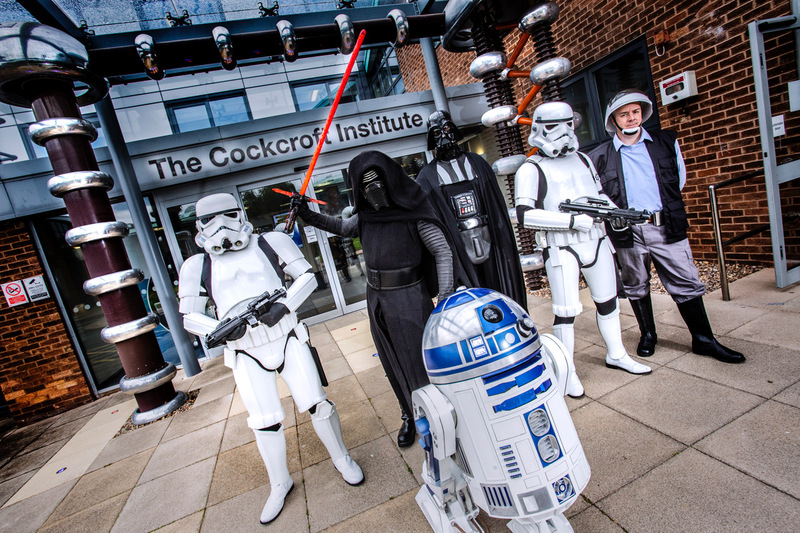 Finally, a number of Star Wars characters, including R2-D2, Darth Vader and Kylo Ren “invaded” Daresbury Lab campus and helped create a very special atmosphere. The force was strong at Daresbury Lab on 11th October 2018. Absolutely no seat was left and a number of staff had to stand in the back of the room when Prof Welsch started his seminar and described what is science and what is fiction in the famous movie series that started more than 40 years ago, in November 1977. Professor Welsch first covered some basic questions related to space fights, space craft flight manoeuvres and whether one can travel through hyperspace, before continuing to show how specific aspects of the films are linked to his ongoing research programme. 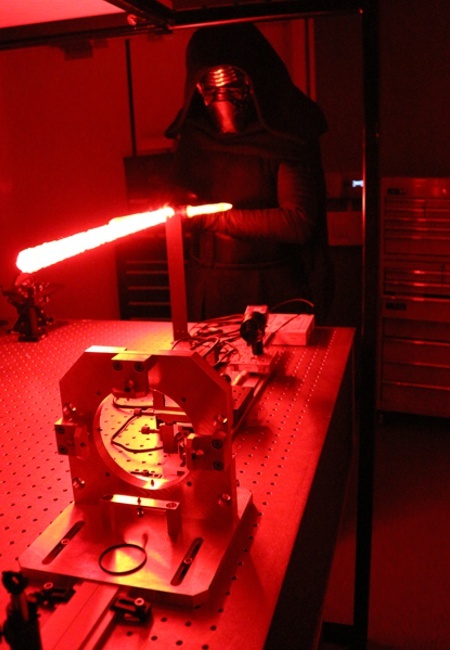 Kylo Ren verifying the alignment of the optical setups in the Cockcroft Institute’s laser lab. He showed that the iconic lightsabre, weapon of choice for those strong with the Force, would not be possible according to the laws of physics, but that there are many exciting applications already, such as laser knives controlled by robot arms for high-precision surgery and adaptive manufacturing using lasers for creating complex metallic structures. He also showed how accelerator scientists in the international EuPRAXIA project are using lasers to design the world’s first high-energy plasma-based accelerator with industry beam quality. He then discussed the famous scene when Luke Skywalker in 1977’s A New Hope, the very first Star Wars movie, uses proton torpedoes to destroy the Death Star and how this relates very closely to using ‘proton torpedoes’ in ion beam-based cancer therapy. He linked this scene to the activities in the pan-European Optimization of Medical Accelerators (OMA) project that he is coordinating and that involves several CI partner universities. There, proton beams are used to target cancer cells hidden deep inside the body of a patient. CI experts develop techniques that can monitor these beams better than anything currently available, helping to improve cancer care. 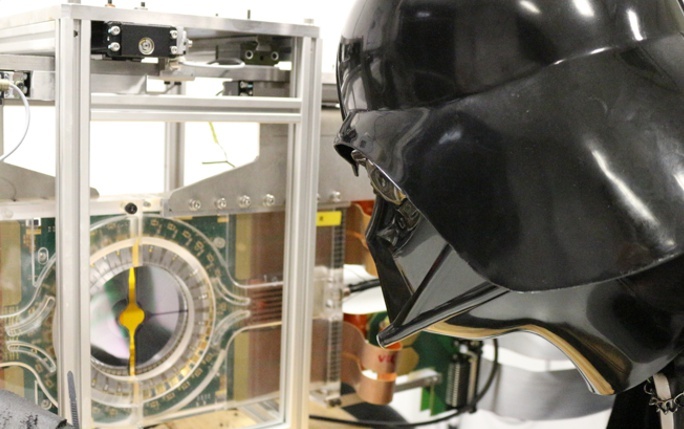 Lord Vader inspecting the VELO detector that shall be used for medical imaging at the Clatterbridge Cancer Centre. It was a very special afternoon on Daresbury lab campus that fascinated everyone for both, Star Wars and accelerator science. This was not an official Disney/Lucasfilm event, but planned, organised and run by Liverpool staff and students. It was supported by STFC through the Cockcroft Institute core grant and a Spark Award. The kind permission of Lucasfilm to use film excerpts as part of the seminar is acknowledged.